Objective: Single agent Docetaxel is a standard therapy for patients with non- small cell lung cancer after the failure of platinum- containing regimens. The aim of this study was to explore the efficacy and safety of Docetaxel monotherapy as second- line chemotherapy in pretreated patient with inoperable non- small cell lung cancer. Methods: From January 2005 to May 2008 thirty- six consecutive patients with locally advanced or metastatic morphologically proven stage IIIB/ IV non- small cell lung cancer entered the study after failure of previous platinum- based regimens. Treatment schedule consist of Docetaxel 75 mg/m2 administered every three weeks with repetition after 21 days with Dexamethasone premedication. Results: Overall response rate, median time to progression and median survival was 16,6 %, 4,5 months and 5,6 months respectively. The main hematological toxicity was neutropenia. Conclusions: That data suggest that single agent Docetaxel remain reasonable choices for the chemotherapy in pretreated patients with non- small cell lung cancer. Key words: Docetaxel, Non- small cell lung cancer, Second- line chemotherapy. Davidov DN. Single Agent Docetaxel as Second- Line Chemotherapy for Pretreated Patients with Recurrent Non- Small Cell Lung Cancer. J of IMAB. 2013; 19(1):387-390. 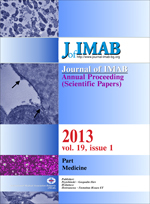 DOI: 10.5272/jimab.2013191.387. Correspondence to: Dr. Deyan Nikolov Davidov, Department of Chemotherapy, Oncological Center, Medical University Pleven; 1, "St. Kliment Ohridsky" Str., 5000 Pleven, Bulgaria.